The 51-year-old father-of-two who died following an incident at Terex Finlay was laid to rest following Requiem Mass in Loughmacrory on Wednesday. Stevie McTeague passed away in hospital after sustaining fatal injuries when he became trapped under machinery on Thursday, (July 14. He had just moved to the Loughmacrory area with his family – wife Helen and children Conor and Ryan - six months ago. Mr McTeague was laid to rest following Requiem Mass at the Church of St Mary, Loughmacrory. Parish priest Fr Thomas Mallon spoke of a man who enjoyed time with his sons at Omagh Golf Club, and who had a huge passion for photography. Police confirmed that Mr McTeague was working at premises in Killyclogher when the incident occurred. A spokesman added that a post mortem examination would be carried out in due course. In a statement to the Mail, Terex Finlay said: “We are very sad to confirm that our colleague, Steven McTeague passed away in hospital In Enniskillen on Saturday, July 16, following an accident at the site. Our concern at this moment is for the family, friends and colleagues. “We are working with internal and external experts to investigate the root cause of this tragic accident,” said a spokesman. 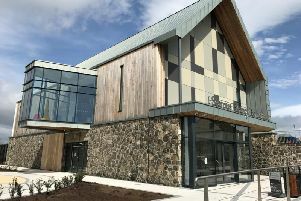 A spokesman for the Health and Safety Executive said it is “investigating a workplace incident at business premises in the Omagh area on July 14”.